Happy Saturday morning! I’ve got another girlie birthday cake this week! 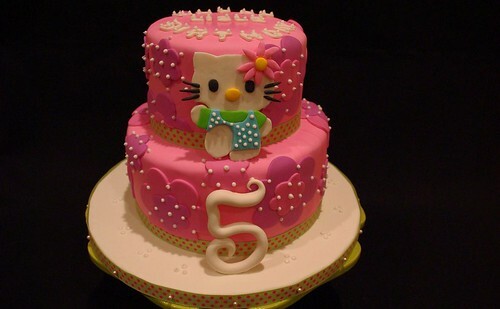 This one is for a little girl named Lisle who is turning 5… Her Hello Kitty themed birthday party clearly called for custom Hello Kitty birthday cake, so voila! It’s a two-tier chocolate cake with pink vanilla buttercream filling. The pink icing is vanilla fondant, and the decorations are done in fondant and gum paste. OMG - I LOVE IT!!! Hi Nicole. Our mutual friend Melissa Maldonado-Garcia directed me to your website. I just started taking a cake decorating class to learn the basics and am so inspired by your designs. 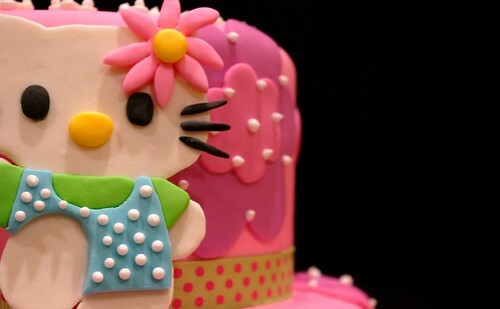 Your cakes are awesome and hope to get that good one day. Congrats on your award and thanks for the inspiration. Awesome cake Nicole!! My girls and I love visiting your site and seeing your weekly creations! I love your cakes. I am a BIG fan of bakeries and since moving to Austin from California 10 years ago, have been very disappointed in the lack of quality bakeries. I watch Cake Boss and the other show?? all the time. Your cakes are amazing. I am planning my daughter’s birthday party and may have to use you next year. BTW- what is your time line for making a custom cake?? Hi Diane! Thanks so much for the super-sweet comment! It made my day! I would love to talk to you about creating something for your daughter’s birthday… I’m booking 1-3 months out right now - if you’ve got a date in mind, let me know, and I’ll pencil you in!